I just wanted to check in really quickly and share a few tips that I’ve found helpful during my purge. I already shared these on Instagram, but I know not everyone is on there, so here they are for you! Check out tips 1 and 2 (do it NOW and do it ALL) in my last post. Tip 3 – This one is my main takeaway from The Life-changing Magic of Tidying Up by Marie Kondo (affiliate link). After you’ve gathered up all your clothes, pick up each item and ask yourself, “Does it spark joy?” Does it make you feel happy to see it, touch it, pick it up? If our main goal in life is to be happy, we should be surrounding us with things that make us feel happy. When we open our closets, we should see just those articles that bring us joy and get rid of everything else. It’s scary when you realize just how much you’ll need to get rid of. I know that I was worried that I’d have nothing left. But I can honestly say that it feels so good to just see the things that I love. All those other articles of clothing work against our happiness. They carry bits of guilt, shame, embarrassment, whatever – for never picking it, for spending the money but not wearing it, for not being the right size. No sense keeping that stuff around! So again, pick it up and ask, “Does this spark joy?” If not, get rid of it. Tip 4 – If you need a more practical question – some people use the “1 year” rule. Have you worn it in the last year? If not, get rid of it. If you didn’t wear it last year, you aren’t going to wear it this year either. 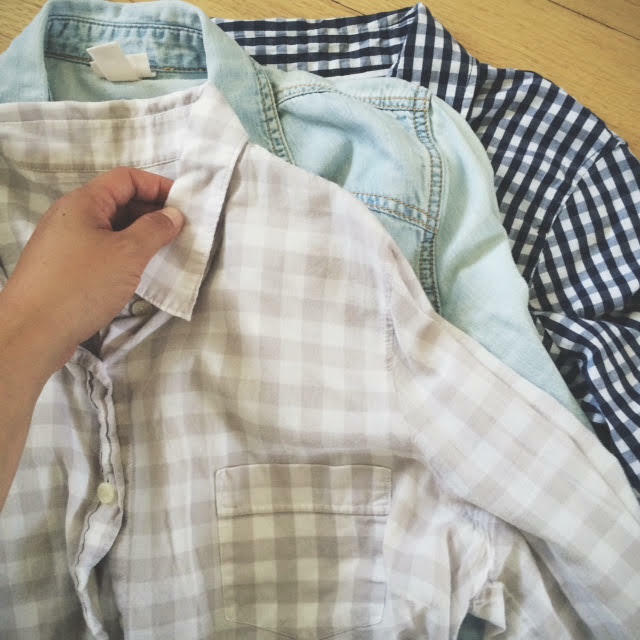 Tip 6 – When you’re saying goodbye to your clothes, especially the ones that are hard to get rid of, thank it for whatever role it played in your life and then let it go. Maybe it’s your old favorite band or concert t-shirt or maybe it was that dress you bought because it looked cute in the store, but you just never found the right time to wear it. All of these items have fulfilled their purpose, but if you’re not wearing it and it doesn’t bring you joy, you should say ‘thank you’ and get rid of it. Thank you for making me feel like part of a team. Thank you for the memories that you hold. Thank you for teaching me what is not flattering on me. Thank you for fulfilling my need to buy something when I was stressed that one day. Whatever it may be. The shirt above was a favorite that I’ve had since I was an undergrad, but it’s too small for me and I haven’t worn it in years. I’ve kept it for so long hoping it would fit me again one day, but I realize it’s time to let it go. I am grateful for all the good times I had it in, but I’m ready to pass it on to the next person to love. 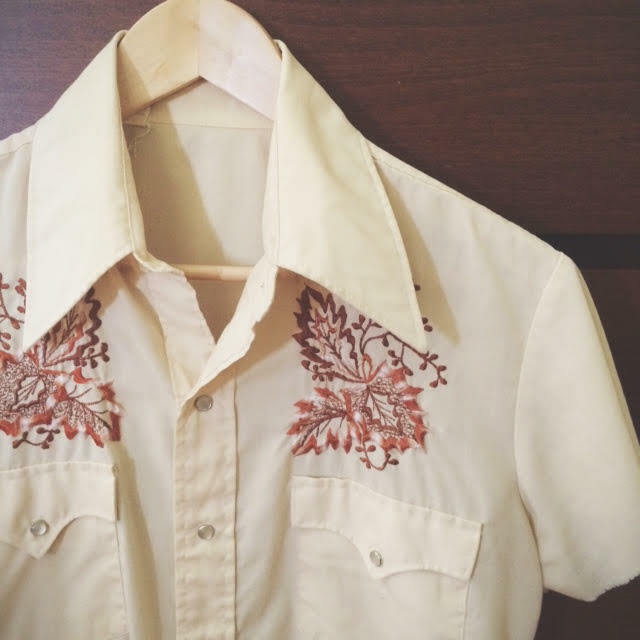 I had a few people asking and talking about refashioning old clothes and that’s a tricky one. I know there are a lot of people who love to take old clothes and make them new, but it’s also dangerous to simply move things from one part of your house to another. Making a large refashion pile is not really a solution to a cluttering problem. If you are anything like me, that pile will just sit and sit and you’ll feel guilty every time you look at it, but you’ll still choose to sew with new fabric every time. So for me, I just try to get rid of it no matter how great the potential. Let someone else wear or refashion it. 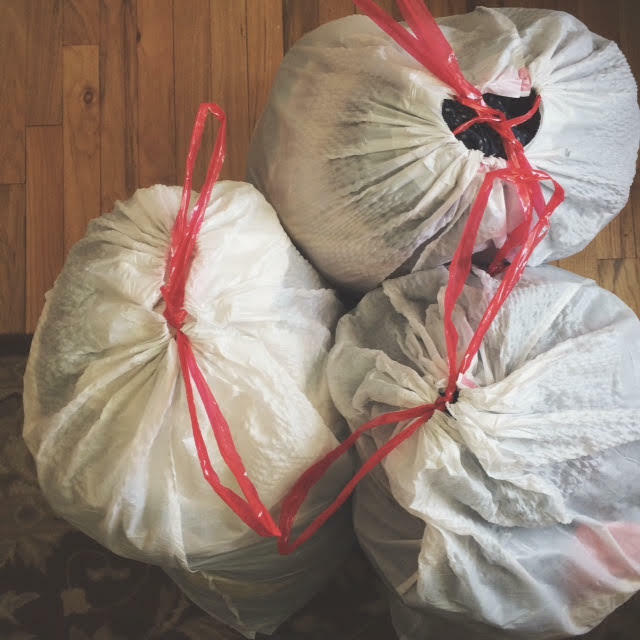 After going through my closet and drawers I had three garbage bags full and ready to be donated! That’s the bulk of it, but I still have to go through shoes, jackets and bags. It feels so good so far. I’m motivated to move through other parts of the house next! How are you doing? All done? Still going strong or maybe dragging your feet? You’ve still got a few days left to get to it, if you want to join us! 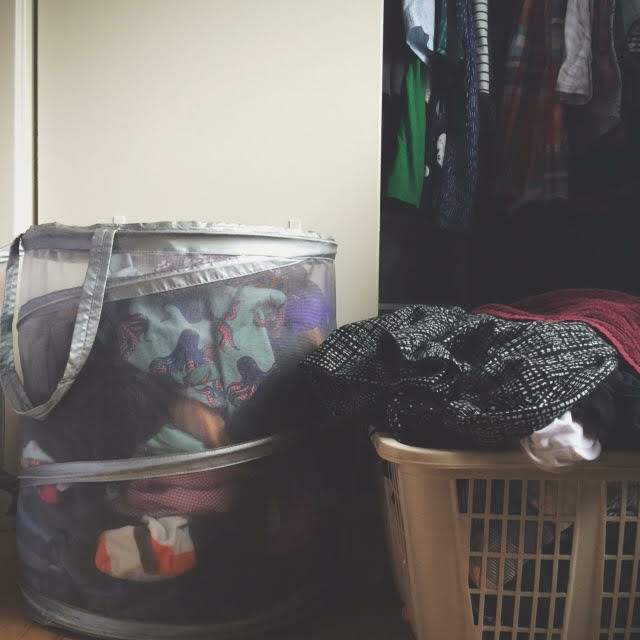 This entry was posted in other and tagged decluttering, konmari by Cherie. Bookmark the permalink. These tips sure are helpful. I will definitely try at least one the next time I purge my closet which is way overdue. i did mine yesterday. There actually isn’t too much left, but they are all things I actually wear. I probably need to go thru my dresser too- there is a drawer full of t-shirts that carry fond memories, but I never wear them…. Awesome tips! I so need this! My wardrobe is literally bursting at the seams, yet I have the ‘I don’t have anything to wear’ dilemma every morning. I agree, my “refashion” pile is mostly just a source of guilt. Time to say goodbye! hmmmm…me too. 😦 My dreams and desires are SO big! Hi Cherie, tip 3 and tip 5 are so true!! Just don’t try the clothes, and thank them instead. Great posts, I will share them in twiter if you don’t mind. LOVE the “Does it spark joy” question! Great post! So many good tips here! I just got my copy of the book yesterday and have already almost finished it. I can’t wait to get started in my closet! I love idea #3! I have to try it. And I am so guilty of #5, everything always looks too good to get rid of but I don’t wear it! I got a book several months ago, mentioned in a blog i follow. The Japanese art of tidying up. I burned through the first couple of chapters, telling husband about plans and then listened to his grumbles. But, having been married 27 years, he was not worried. I didn’t follow her instructions, I started with just one room and 6 hours later felt over whelmed and hopeless. I realized I do not have a house that can be done all at once and one weekend is not long enough. I know husband realized this way before I did. I admit, i avoided my closet, but my craft supplies (jewelry and scrap-booking) look amazing…..I gave away boxes of stuff. I guess it’s a work in progress. thanks for your post. Im an over purger. I constantly purge my closet then realise i have nothing left to wear 😦 Then a year later i will think, where is that top, i really liked that top, but no i threw it out! Hi! I will be doing closet cleaning in two days and love the tips you gave, I think I am going to use those tips. Hope it will make the work interesting. I am also a blogger, a new one plz do check out my blog, feel free to comment or like. Thanks for sharing and I’m going to share my post on my closet purge as well as my wardrobe capsule. I finished my closet and I just wrapped up my son’s, if only I could get my husband on board………..
Thankful for this post! Needed some motivation to do a closet purge! I love the one year rule! Reblogged this on Style By Kikazi.